Peru’s largest consumer goods company Alicorp is facing criticism over a recent report that the company is sourcing palm oil from deforested plantations. Research organization Convoca published a report on November 30, 2018 that Alicorp has been purchasing palm oil that is linked to deforestation. Convoca says that Alicorp has bought palm oil that originated at plantations owned by Dennis Melka, a Czech-American entrepreneur, that are deforesting. Melka’s operations have been connected to deforestation throughout this decade in Latin America and Asia. He began purchasing hectares in Peru in 2010, primarily from small landowners. His companies in Peru have also come under scrutiny for illegal labor practices. In January 2017, Melka resigned from his position as managing director at United Cacao as it went through a period of significant financial stress. Based on the Convoca report, companies under scrutiny for buying from Melka’s plantations and supplying Alicorp with palm oil include Oleaginosas del Perú (Olpesa) in Tocache and Oleaginosas Amazónicas (Olamsa) in Ucayali. In March 2017, Chain Reaction Research’s (CRR) report on Alicorp highlighted that the company is exposed to numerous business risks due to not having a no deforestation, no peat, no exploitation (NDPE) policy. CRR’s analysis concluded that four percent of the company’s revenue may be at risk due to increased demand for zero-deforestation products, possibly leading to a 12 percent decline in the equity price. An NDPE policy for Alicorp, which has a presence throughout South America, could significantly cut demand for palm oil in Peru, a relatively small market, that is tied to deforestation. Alicorp is 45.7 percent owned by Grupo Romero, which also owns Alicorp’s main competitor, Grupo Palmas. In April 2017, Grupo Palmas became the first Peruvian company to adopt an NDPE policy. Alicorp, the largest buyer of palm oil in Peru, is working toward sustainability commitments. However, although the company is a member of the Roundtable on Sustainable Palm Oil (RSPO), it lags behind its competitors in Peru, possibly creating reputational risks. Peru relies on small farmers for its palm oil production, making traceability difficult. In its most recent annual plan submitted to the RSPO, dated May 9, 2018, the company said it is aiming for its first supply chain certification in 2019 and will use 100 percent RSPO certified palm oil in 2030. Until then, Alicorp may continue to face business, financial and reputational risks from sourcing palm oil linked to deforestation. 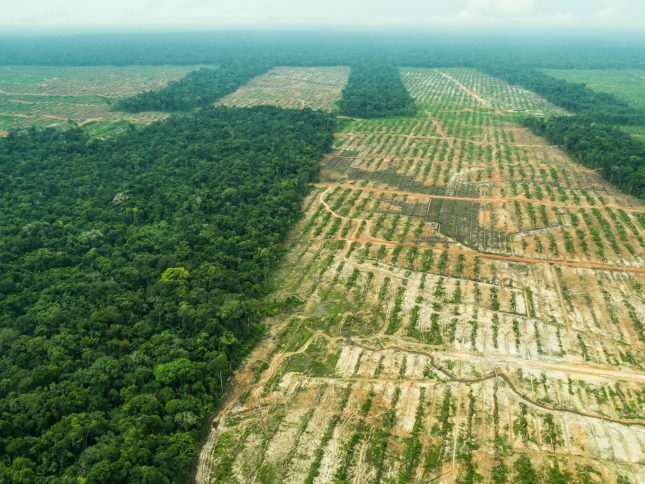 The expansion of palm oil in Peru has led to increased deforestation in the Amazon. The Monitoring of the Andean Amazon Project (MAAP), in a 2015 report, highlighted large-scale oil palm as the main factor behind deforestation in the country. From 2000-2015, the amount of primary forest cleared for large-scale oil palm totaled 28,000 ha, the equivalent of 36 percent of the total area cultivated for oil palm. UK supermarket giant Tesco announced on November 16, 2018 that it is partnering with the World Wildlife Fund (WWF) to reduce the environmental impact of food sold in its stores. The company plans to meet its goal of cutting its environmental impact by 50 percent through providing its customers with “sustainable” food choices, protecting habitat in its food production, and cutting waste in packaging. Consumer sentiment has driven Tesco to make these changes, the company said. In a survey of 2,000 customers, commissioned by Tesco, 80 percent said they want retailers to take more action to reduce the environmental impact of the food supply chain. WWF and others have labeled Tesco as a leader in adopting policies that reduce deforestation. The company has said that by 2025, it plans to use soy from only supply areas that have verified that they are not undergoing deforestation for production purposes. Tesco was one of the first signers of the Cerrado Manifesto, a voluntary agreement calling for zero deforestation in the Cerrado, and has also complied with the Amazon Soy Moratorium, a voluntary agreement to curb deforestation in the Amazon.